St Thomas is a Caribbean tourist magnet, fully equipped to provide all sorts of entertainment for holidaymakers. 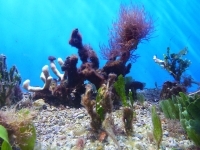 Sports and activities are abundant on St Thomas: there are excellent snorkelling and scuba diving sites; quality greens for golf enthusiasts; sport fishing operators; and yachting opportunities. Naturally the beaches of St Thomas are a big draw card for travellers. Favourites include Lindquist Beach, Honeymoon Beach, Secret Harbour, Bluebeard's Beach and Magens Bay. 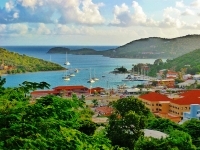 Charlotte Amalie promises epic shopping sprees and great restaurants and the nearby resort town of Red Hook, a smaller version of Charlotte, also provides fun eating out and shopping opportunities. Red Hook is also the jumping off point to other Caribbean islands and the upmarket beach resorts nearby. The educational Coral World Ocean Park provides a unique look at the goings-on of Caribbean marine life and is well worth a visit, especially for those travelling to the US Virgin Islands with kids. 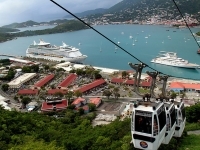 Another touristic must on St Thomas is a trip up to Paradise Point on the St Thomas Skyride, which offers spectacular views. We are looking for contributors for our St Thomas travel guide. If you are a local, a regular traveller to St Thomas or a travel professional with time to contribute and answer occasional forum questions, please contact us.